Raymundus Lullus (1232 - June 29, 1315) (sometimes Ramon Llull or Raymond Lully) was a tertiary Franciscan monk from what is present-day Spain. 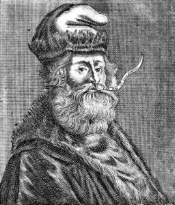 Lullus contributed greatly to many fields, especially election theory and computation theory, but was also an active botanist and alchemist who is well known for being the first to discover the chemical group later called ether. After Lullus completed his formal education, he became tutor to James II of Aragon. Later he became a tertiary Franciscan and wrote treatises on Alchemy and botany. He also published major works on Christian theology, mostly on ways to convert Muslims to Christianity.